Artist's Note: Someone wanted me to draw a chibi version of Ursula from Once Upon A Time. WARNING THIS MIGHT BE A HUGE SPOILER. IF YOU HAVEN'T SEEN THE SEASON 5 YET PLEASE SKIP THIS PICTURE. 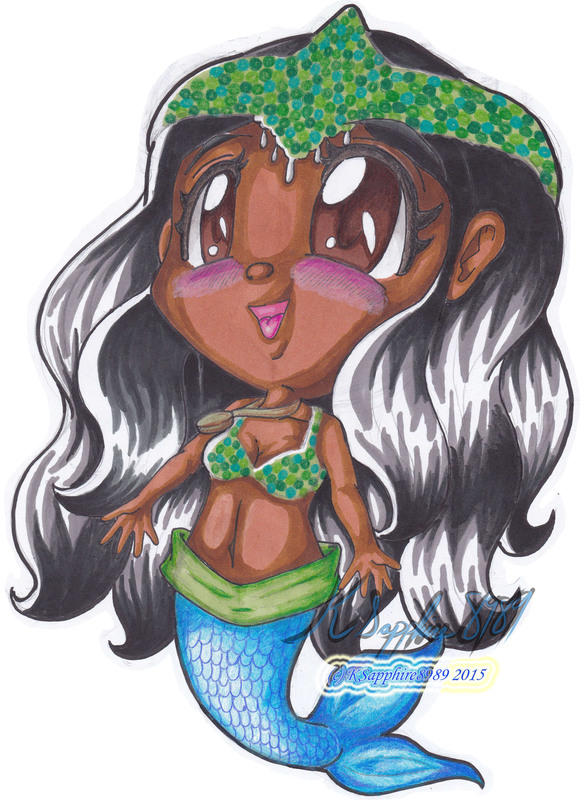 Anyway, this a chibi version of Ursula before she became the infamous sea witch we know and love. It was very interesting story that surrounding her and its nice to know that she wasn't out there just be mean. Also I feel she turned out pretty cute in the this. Now, for the things that drive me nuts about this picture. I'm very mad at myself for having such difficulty with blending. I'm not sure how to properly blend markers. Sometimes, I do a decent job and others ....its cell shading. I want to be a better artist and actually not liking her skin shadowing. Another thing that is an issue with my is the her hair. I need to do a better job and not have so much of a gap with the highlights in her hair. I feel it doesn't look neat enough for me. I feel I can do a lot better. But other than that I think the picture looks okay.